Castles, palaces, forts, lakes, and luxury- Rajasthan is, in all ways regal in all senses. Amidst the signature dessert, there a number of cities in Rajasthan that truly makes for the most romantic Oases in India. We, at Shree Ganesh Events, would happily recommend Wedding in Rajasthan, if you are aiming for a big, fat and truly memorable wedding. Experience the mirthful, clear-blue sky, the fairytale palaces, the temple that evidences our glorious past and the lush gardens cradle in the Aravallis. All these make Rajasthan a captivating blend of aesthetics and surreal experiences. The Royal Weddings in Rajasthan that we arrange here at Shree Ganesh Events give you more than mini vacationing experiences to your guests. As for example, instead of the conventional ‘baraat’ or procession on horses, we can arrange for the same on a boat. This is not something that you get to enjoy always at any Royal Wedding Places in Rajasthan. Your guests can have the unique experience of elephant polo in the afternoon, and later enjoy a cocktail party in the late evening. And of course, no destination wedding in Rajasthan becomes complete without folk dance performances. Our team would arrange for the finest dance performances that you might have ever experienced. The bride and groom, along with their friends and family would like to tap their feet to the rustic tunes, as well. 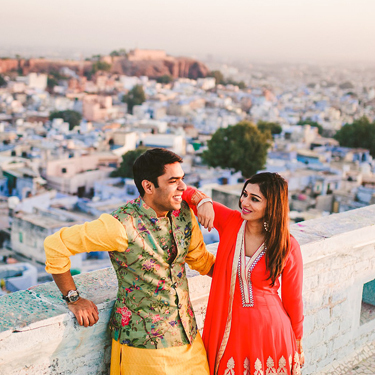 Most of the couples visiting us for Destination weddings in Rajasthan tend to prefer the cities of Jaipur, Udaipur, Jaisalmer, and Jodhpur for the wedding venue in Rajasthan. And we agree that there are some obvious incentives of choosing these places. To begin with, Jaipur is a practical choice for customers who would have guests traveling from Delhi and adjoining areas, as well as from Mumbai, Ahmedabad, Lucknow, and Chandigarh. Reaching Jaipur from any of these places is absolutely hassling free. 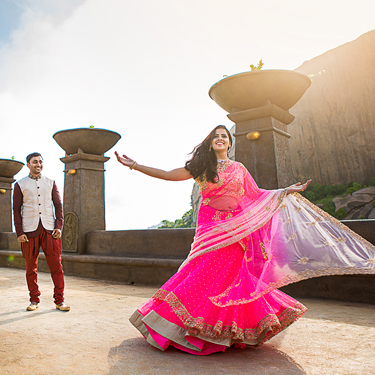 Again, Udaipur with its pristine beauty and serenity compliments a private, romantic wedding. Its proximity to Gujarat makes it a favorite among our Gujarati customers, as well. Getting married with the golden sand dunes of Jaisalmer is a fantasizing idea for sure. However, if you are choosing a vibrant, elegant, scenic and placid wedding venue in Rajasthan, then we have some fantastic wedding venues in Jodhpur waiting for you.